TALLADEGA, Ala. -- Brad Keselowski won a demolition derby at Talladega Superspeedway, where multiple wrecks caused two cars to go airborne and led to millions of dollars in damage to race teams. "Racing has always been that balance of daredevils and chess players. This has always been more of a daredevil-type track," said Keselowski. Chris Buescher's car flipped three times in an early crash, and Matt Kenseth was turned upside down in the waning laps. In Kenseth's crash, Danica Patrick hit hard into an energy-absorbing wall that seemed to buckle upon impact. She appeared shaken after the hit. There were 21- and 12-car accidents in the final 28 laps. And as Keselowski crossed the finish line, another wreck in the back of the pack punctuated the sloppy day. NASCAR's box score showed 35 of the 40 cars were involved in some sort of accident. Only 21 finished on the lead lap, and 12 cars were ruled out of the race. Austin Dillon finished third and said he enjoyed the race, even though it was nerve-racking. Dillon was in his own horrific crash at Daytona in July and said the style of racing at restrictor-plate tracks creates an atmosphere of danger. "We all have to do it. I don't know how many really love it," Dillon said. "I know our moms, wives and girlfriends don't like it. We don't like to be part of crashes. If people are cheering for crashes, man, it's not a good thing." The pace of Sunday's race was up a tick because of potential rain that could have shortened the event from its scheduled 180 laps. Once the race hit the halfway point and was official, drivers began their charge to the front because they couldn't afford to wait and have rain suddenly end the event. Patrick, who was inside the top-10 when she was hit by another car and turned into Kenseth, said the potential rain intensified the racing. Jamie McMurray, one of the better plate racers in the series, thought Sunday was pretty typical. "Everyone is pretty calm until we get to halfway because we all want to get to halfway, and then it got a little bit wild after that," he said. "But it's just plate racing. When you look back at all of these restrictor-plate races, you have a lot of wrecks that just don't happen. And today we had a lot of wrecks, and they happened." AMELIA IS DESTROYED: Defending race winner Dale Earnhardt Jr.brought his favorite car, named "Amelia," to Talladega in search of his first win of the season. But he wrecked on Lap 50 and had to go to the garage. Earnhardt eventually returned to the track, and his steering wheel mysteriously came off in his hand. He had to steer the car with his hand on the steering column as he put the wheel back on. Then he was collected in a wreck with Carl Edwards. He finished last. "Hell, I'm going home. I'm done," Earnhardt said. "I think we need to park the car for a while too." EDWARDS ENDS STREAK: Edwards was seeking his third consecutive victory but came up short when he suddenly crashed his Toyota. "Something just let go there," he said. "We had something torn up there, drove down into Turn 1, and I just felt the right front fall down and that was it. You're kind of just along for the ride." Edwards scored back-to-back wins at Bristol and Richmond -- where he bumped Joe Gibbs Racing teammate Kyle Busch out of his way on the last lap -- and was hoping to make it three straight with a Talladega win. WHAT'S NEXT: A Saturday night race at Kansas Speedway. Jimmie Johnson won the race a year ago, and Joey Logano was victorious at Kansas in the fall. 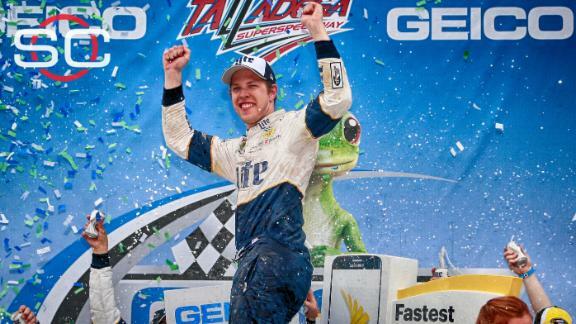 In a race where only 21 cars finished on the lead lap, Brad Keselowski prevails at Talladega for the victory.